The Atlanta Pen Show is coming up this weekend and I am pretty excited about it. Last year was my first pen show experience, and honestly, I was unprepared to take full advantage of everything the show had to offer. This time around, things will be different. In the past year my fountain pen knowledge has grown immensely, but I'm still just a babe. Having someone like Thomas allow me to test out a wide range of pens and teach me about them while we are at it has proven invaluable. I am admittedly very, very lucky. So how do I repay that luck? 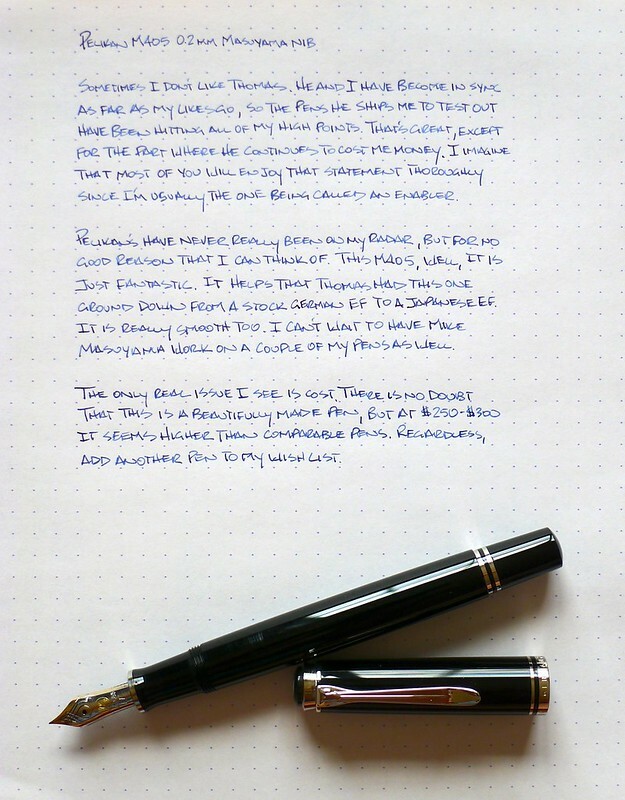 Let me start by telling you a little about the Pelikan M405 that Thomas loaned out to me. Thomas sends his pens in batches and there is always a very detailed note about the contents. Specifics like any extra nib work done or some personal history behind the pen. The Pelikan M405 was part of the third batch of pens he sent, and for the first time, Thomas let me know how important a particular pen was to him. The M405 is his baby. In fact, knowing that I don't turn pens around quickly, Thomas asked if I could review this one soon and get it headed back his way. Absolutely, I said, so I reviewed it plus three other pens over a few days and shipped them back. And how did I repay Thomas for loaning me out his favorite pen? I forgot to clean it before sending it back. I am super meticulous about cleaning my own pens. Someone else's pens? Even more so. I talked to Thomas about it and I think what happened was I cleaned the pens I sent back to him as a group, and somehow I missed that one among the others. I was so embarrassed! Thomas was a saint though, as he has been through this whole process. Needless to say, I don't think this mistake will happen again. So, about the Pelikan M405 itself. This was the first Pelikan fountain pen I have used, and I can see why Thomas loves it so much. There is not a lot of pomp or flash with this pen, but everything it does have it gets exactly right. The weight is right, the balance is right, the feel is right, the look is right. I could tell all of these things the second I picked it up. And the nib, well, it is just exquisite. The German extra fine 14K gold nib has been ground down to a Japanese extra fine 0.2 mm by respected nibmeister Mike Masuyama. This is what I am looking forward to most at the pen show that I wasn't prepared to handle last year. Mr. Masuyama will be at the show, and I plan on having him work on a couple of my nibs. I felt too green to even approach him last year, but working with Thomas these past few months has changed all of that. And who knows, I may even come home with a Pelikan. 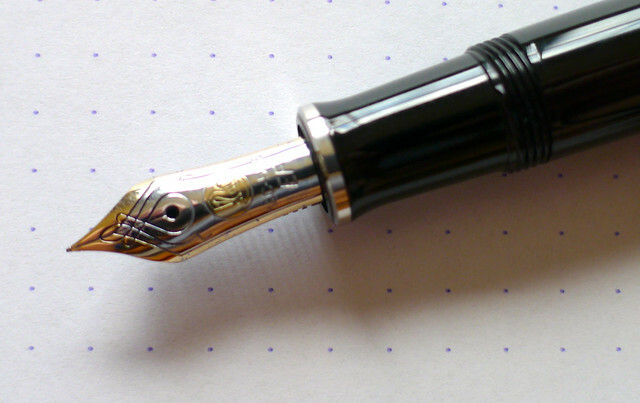 Posted on April 8, 2013 by Brad Dowdy and filed under Fountain Pens, Pen Reviews, Pelikan.